Is this kid my only choice? LIARS! They said 2-6 years... that one's 7! I'm reporting your asses to trading standards, Asia Town Buffet! Born in 2003, missing in 2006 at the age of 7, then stepped back in time 1 year and aged another 5 years... was he in Flight of the Navigator? Looks like a "Village of the Damned" kid! I guess they couldn't be bothered to make a new age-progressed photo every year. BTW I'll go with the buffet. Buy one get the same one free! New special! 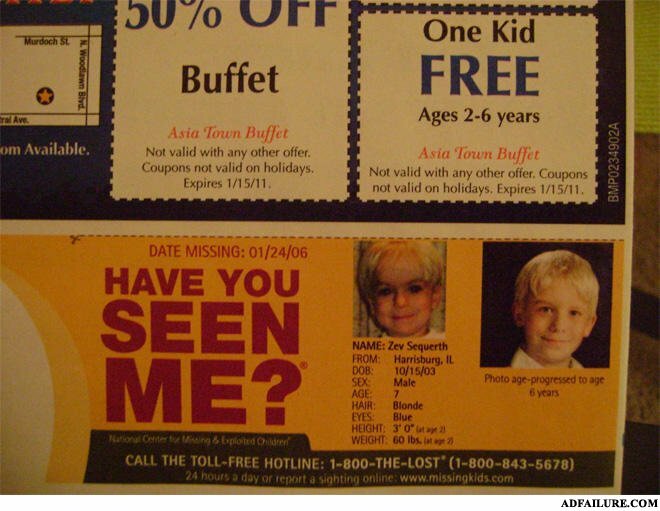 Am I the only one that noticed that the second ad has a missing kid aged 7, but his photo is age progressed to 6? Why yes, I have seen that kid. He was delicious. I like kids, but I can usually only manage to eat one. Why did the chicken cross the road? Because it saw food on the other side the the farmer was going to chop his head off.